The Stage. On the stage in place of a traditional pulpit, a portable podium provides the perfect balance between portability and features. Instead of moving a large, heavy wood pulpit around the stage to make room for band members, drama performances, and other needs, just use a portable podium. It sets up and collapses down in seconds, and can be stowed against a wall, under a pew, even under choir risers until needed. But it still has all the features a minister needs - a place for notes, books, a drink, and media ports for speaker and electronics wires. Classrooms. In Sunday school classrooms, a portable podium or collapsible lectern offers the ultimate in flexibility for any small group. Rooms in a place of worship may be used for many different purposes throughout the week. 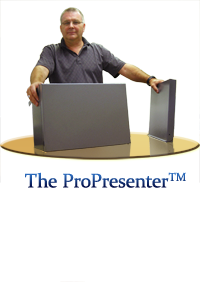 When you need a place for a speaker to set notes, or a teacher to prop a book, pop open the all-one-piece, lightweight aluminum ProLectern™, or set up the smaller ProPresenter™ on a desk. When you need the whole room for a group game, collapse it quickly and hang the podium on the back of a door or stow it in a closet. Outdoor Events. For special outdoor events, the weatherized aluminum construction of the ProLectern™ can withstand sun, rain, heat, cold and spills without warping, fading, blistering or staining. Instead of dragging a heavy pulpit outside for a baptismal service or Fall Festival, carry the ProLectern™ all over the church grounds easily with its ambidextrous built-in handles. Worship. 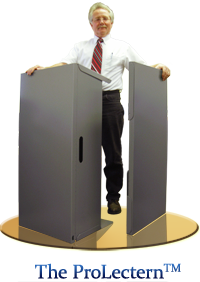 For choir, worship leader, praise team, or band use, ProProducts™ foldable, lightweight, fully-featured podiums far outstrip your average music stand. 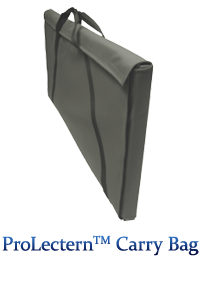 Instead of just being an often-rickety place to set sheet music, the ProPodium™ offers musicians a place to set a water bottle, store music books and folders, even tuck a purse in the cabinet. The sturdy construction prevents it from tipping, and since it’s constructed as all one piece, the top can’t loosen and slide down as music stands are prone to.